When onboarding an employee, you’re doing more than introducing them to the company. You are creating a vision of the organization and setting expectations for their experience. During the onboarding process, the employee starts to form their opinion of the company and their comfort and fit with workforce. This could be the difference between the employee deciding to stay with or leave the firm. The Bureau of Labor Statistics (BLS) reported that 3.2 million Americans voluntarily quit their job in December 2017 and that more than 20 percent of workers leave their new employer within the first 45 days. That kind of turnover is expensive (25 percent of their annual salary, according to the BLS) and time-consuming. If it becomes a problem in your organization, it can also create negative perceptions about your company that can spread through the industry and hinder your ability to hire and retain great people. Stop high turnover before it starts. In this article, you’ll find information and expert advice about the onboarding process, best practices, and easy-to-use tools that can make your company an organization that embraces great candidates — and keeps them on the job. HR professionals trust Smartsheet to help manage everything from simple onboarding tasks to complex change management programs, all while ensuring their employees come first. What Are Employee Onboarding Processes? A good first impression makes all the difference in relationships, including the one employers have with their employees. Onboarding processes, usually managed by training and/or human resources departments, are designed to help new employees ‘learn the ropes.’ Also known as ‘organizational socialization,’ these comprehensive processes teach and support the behaviors, skills, and knowledge that help hourly workers and managers become effective, committed team members, and in the best cases, raving fans. Onboarding supports new hires and current employees who are transferring to new company positions. Virtually every type of organization uses onboarding for new employees. Within an organization, human resources executives, business owners, upper management, and middle managers are involved in helping onboard new employees. Onboarding is typically tailored for each industry, especially for jobs with high turnover rates. These include restaurants, call centers, retailers, sales organizations, and computer and software developers. Informal Onboarding: These loosely organized activities help a new employee learn about his or her new job. Informal onboarding can include shadowing and off-the-cuff, one-on-one coaching or meetings with management and new colleagues. Startups sometimes dispense with the minimum of onboarding tasks and have a sink-or-swim approach, which could lead to turnover issues. Formal Onboarding: To assist a new employee or someone who has made a shift to a new job feel confident and knowledgeable, pre-determined tasks and procedures can help people adjust to the social and performance aspects of their new position. The sooner new hires feel welcomed and ready for their new jobs, the faster they can contribute to the organization’s mission. What’s the Difference Between Onboarding and Orientation? Orientation is a single informational event that usually takes place during the first week on the job and lasts for a few hours in a classroom or conference room. A manager provides general information that all new hires need to know: company policies, benefits, and insurance, etc. 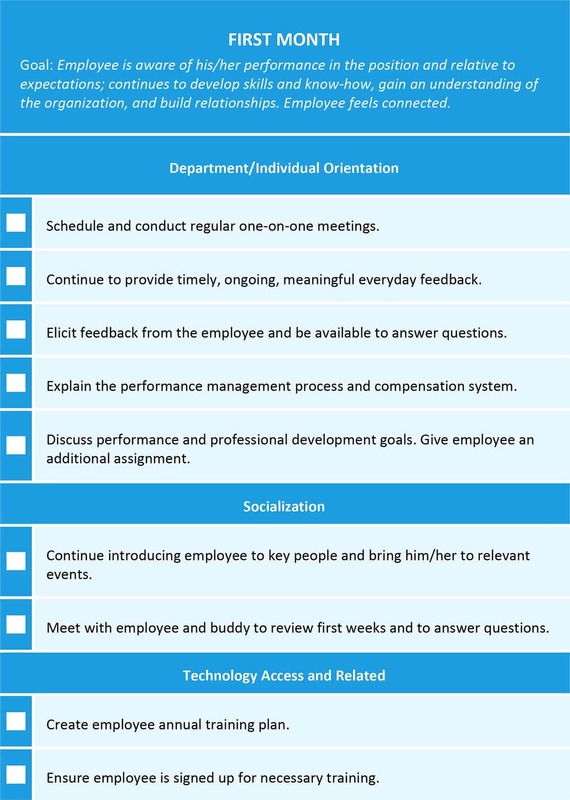 The onboarding process continues after orientation and zeroes in on the employee’s role in the department; it typically takes place with an individualized agenda and among an employee’s direct colleagues. Whereas orientation takes a broader view, onboarding gets down to the day-to-day details. Until the mid-20th century, American corporations didn’t consider employee onboarding a necessity. As American first transitioned from an agrarian to an industrial economy, it was the norm for someone to work for the same company for 30, 40, or even 50 years. Only in the middle part of the century did employees begin considering switching companies and careers, which has become accepted behavior today. The method of socialization depend on the organization, but collective socialization, for example, is common in military boot camps, where every new hire undergoes the same training process. As its name implies, sequential socialization offers a set of steps a new member must follow — school and academia follow this mode. Serial socialization involves mentors working with newcomers. Organizations tend to fall into at least one of these categories. Schein later worked with G.R. Jones to refine the earlier model and align it to two onboarding categories: institutionalized and individualized socialization. In the decades since, corporations and other organizations have increased emphasis on their company culture, particularly how to bring in new employees. The process is known as onboarding. 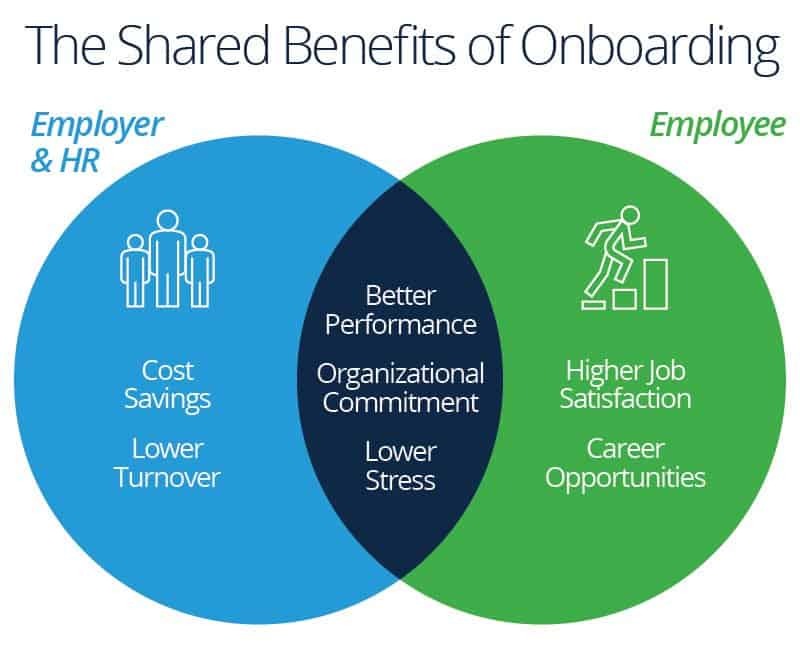 While onboarding offers many benefits for both employer and employee, two main reasons stand out: accelerating time to productivity and preventing employee turnover, one of the largest avoidable expenses. “From a simple human standpoint, onboarding fosters a feeling of belonging,” Matthies says. ”It helps people to hit the ground running and feel secure in what they’re doing.” When new hires feel like part of the corporate family, they tend to do more, stay longer, and complain less. Roughly a quarter of all companies have no formal onboarding process. But as research from MIT Sloan Management suggests, the onboarding period can be the most crucial time in an employee’s experience at a company — with an enduring influence on engagement, performance, and retention. The Society for Human Resource Management says that HR professionals face two major challenges: increased competition for talent and building a strong culture to establish a firm employer brand and to attract the best and brightest. Depending on the culture of the organization, it may be more desirable to increase ambiguity, despite the potentially negative connection with organizational commitment. Socialization researchers have raised concerns over the length of time that it takes newcomers to adjust. Other criticisms include the use of special orientation sessions to educate newcomers about the organization to strengthen their commitment. In cases where these sessions have been found to be formal and ritualistic, studies have found them unpleasant or traumatic — producing the exact opposite result than the organization intended. Helping candidates understand the company brand and culture attracts like-minded people onto the team. That’s why many onboarding programs have a double objective: to prepare new hires to become productive quickly and to shape their all-important first impressions of the company. The latter is more prevalent in competitive fields like software development and information system management, where attracting and retaining top talent is difficult. “Consistency in onboarding is important,” Matthies says. “To create a solid plan, think about your business case: what are your KPIs, what are the burning issues, your company culture, who your best candidates will be and what they are looking for. Most importantly, you need to write it all down.” Why? Once you have documentation, you can review what’s working and what’s not, and keep refining your onboarding process. To create a solid initial process, you need to know about best practices. Established onboarding programs can differ dramatically among organizations, but the successful ones have some commonalities. “While there is a need to tailor onboarding programs to your business and the types of individuals you want to attract, there are basic principles and best practices that tend to be the same in effective programs,” says Matthies. Preparation: Give new hires background materials, schedules, and an idea of what will happen during the onboarding process. Orientation: This short session provides explains the nuts and bolts of the workplace for all new hires regardless of department or roles. It will encompass benefits, insurance, company history, and a high-level view of the company culture, mission, and vision. Integration: Processes will help a new employee fit into her new department, meet colleagues and managers, and receive the tools necessary to do her job. Engagement: The new employee begins work and may have questions that arise with on-hands duties, so onboarding may continue for many weeks. Follow-Up: A manager, the human resources director, or even the company president may check back in with a new employee to see how it’s going, review her comfort and absorption of the company culture, and schedule more meetings going forward. When you look at the statistics, it’s easy to see that employee discomfort and leave-taking emerge early on. “There are tons of statistics like a report from the Aberdeen Group that stated that best-in-class onboarding — which starts early, even before the first day on the job, and lasts longer, like up to two years — results in 91 percent retention,” says Matthies. “I’ve seen it with my own clients. You can see higher productivity ratios, cultural assimilation, and employees who simply stick longer.” Mistakes made during that period can cost organizations big bucks in decreased productivity, new hire mistakes, lack of engagement, and ultimately, employee turnover. In fact, it’s important to implement the basics before the first day on the job. That way, the company and the onboarding facilitators can make the employee’s arrival special. As the old saying goes, you have only one chance to make a good first impression — it’s the same with your early relationship with your new employee, and onboarding is a great place to make it shine. How Long Should Onboarding Last? Who you are recruiting also makes a difference. “You should also think about tailoring to particular positions, the individuals, and their generation,” Matthies points out. “For example, if you’re looking at hiring millennials, you do need to go the extra mile.” The 2017 Deloitte Millennial Survey says millennials are becoming increasingly loyal to their current employer. Even so, 38 percent plan to leave within two years (though that is down from 44 percent in 2016). To keep those members of the workforce happy, creating a tailored onboarding program simply makes sense. You can support employee loyalty by giving employees an idea of how they fit into the big picture, keeping the lines of two-way communication open, and setting realistic performance goals. In addition, mentoring and developing through the full employee lifecycle, along with the use of automation/technology for consistent and timely tracking of onboarding events, ensure that people are supported to full matriculation and job success. Be sure your onboarding process is interactive and participatory. Involve key stakeholders in the company in both planning and the meetings. Furthermore, monitor the progress of your new employees and the effectiveness of the onboarding process continually for improvement. And as you design your onboarding process, keep in mind the objectives for both the company and the individual employee. What impression do you want new hires to walk away with at the end of the first day? What do new employees need to know about the culture and work environment? What role will HR play in the process? 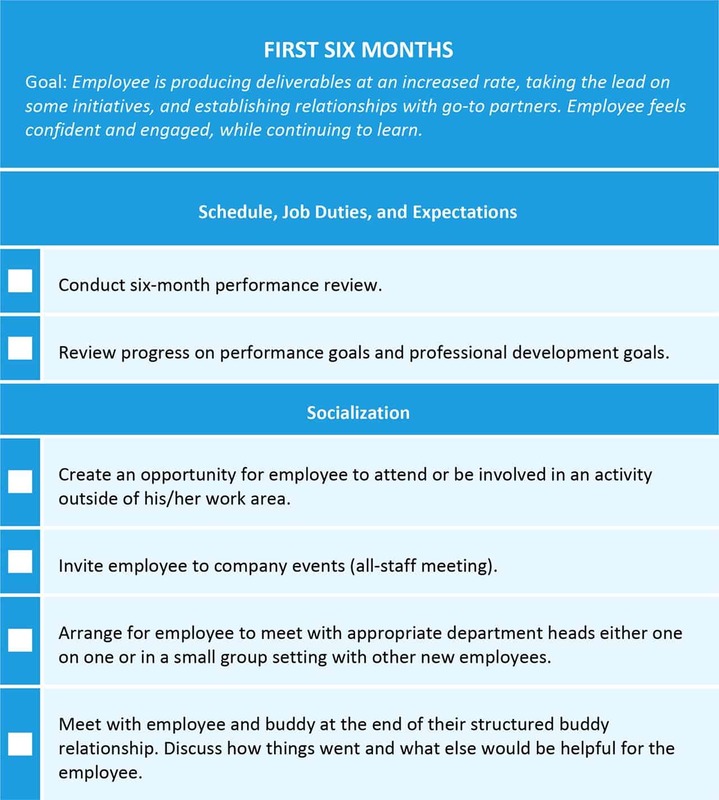 What kind of goals do you want to set for new employees? Finally, how will you gather feedback on the program and measure its success? Being prepared is the first best practice to follow for effective onboarding. Aspen Edge Consulting has provided a compendium to help you create your onboarding processes and standards. “When you create your organization’s onboarding, one thing to keep top of mind mind is that you should treat your candidates and employees like a good customer,” Matthies says. 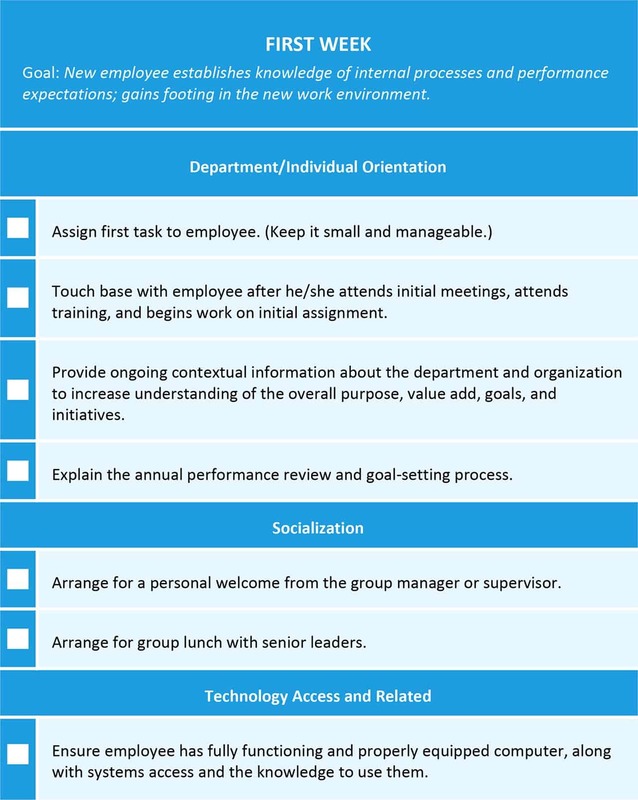 Each organization is different, but typically onboarding might cover formal meetings (including new employee orientation), lectures and training, videos of the company and its products in action, printed materials, computer-based orientation, mentorship, and socialization in online organizations. Not every type of tool will be applicable to each company or to each type of new employee, but some combination of these is typical. 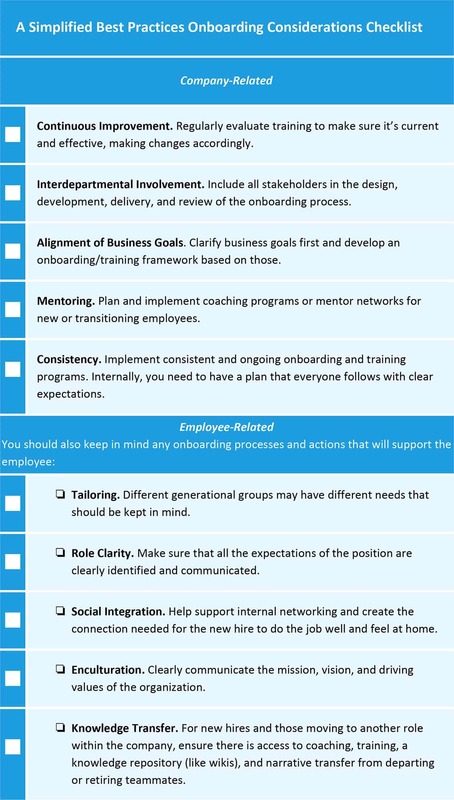 From providing resources to establishing company rules to identifying elements of role clarification and performance expectations to facilitating network-building, the following checklists and templates can move your onboarding processes forward, faster. 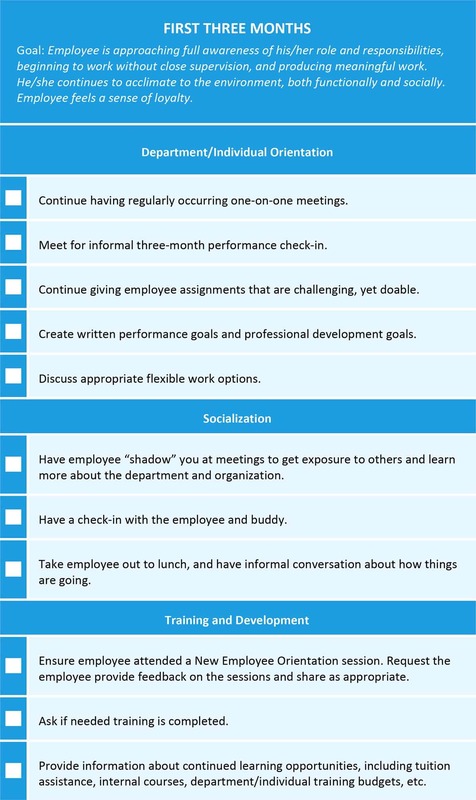 To help build relationships and add structure right from the start, develop a new hire checklist. 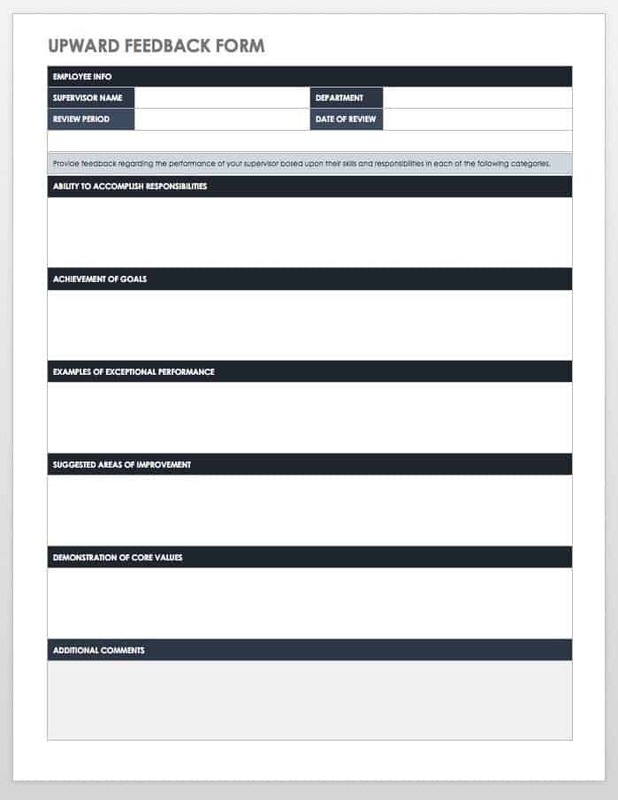 Here’s a free template you can customize to ensure new employees complete all the necessary paperwork and rout it to the right place once completed. How do you cover all the necessary topics with a new hire? You can do some research, check into guides, take classes, and buy software. While those resources can offer a good starting point, your process needs to be uniquely designed for your company. Then make sure you’ve touched on everything, so you can seamlessly move from process to process without a hitch. It’s all about planning and writing down the onboarding process steps. Create a new hire process flowchart that begins the day before and goes up to two years of employment. For hourly workers, making use of a solid process like the one detailed in this article is the key to success. 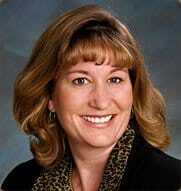 Customization for executives depends on the role, the company, and what has been negotiated at hire. By providing early feedback, a company enjoys benefits that can be grouped into two core outcomes. First, it helps new employees become contributors faster. Second, it decreases the chances of new hire failure, thus lowering turnover and improving retention rates. When your company invests in a great employee experience, it enables new hires to be more successful and increases the chances of the employee staying with your organization longer and driving positive company ROI. Employees who provide feedback feel valued and, as a result, respond with more loyalty and engagement toward their employers. Soliciting feedback on a regular basis is one of the best practices to implement with employees. Once you’ve gathered the feedback, be sure it is shared (anonymously) and acted upon. Business these days never stands still, and neither should staff development. After all, well-acclimated and productive employees are essential to driving business success. Consistent staff training is essential, but can be bothersome to business managers because of the ongoing time and cost. Despite the expense, ongoing staff training can be advantageous, particularly because the expectation that it will be part of the job experience can avert turnover. Once you have a quality training plan in place, you’ll likely see a return on investment on your balance sheet, not to mention with more satisfied employees. As with all details around onboarding, it’s good to have a plan for ongoing training, customized to specific roles. Sometimes it makes sense to move team members to different roles in the organization, but when filling the initial role, you want to pass along what the previous person gained during their tenure. 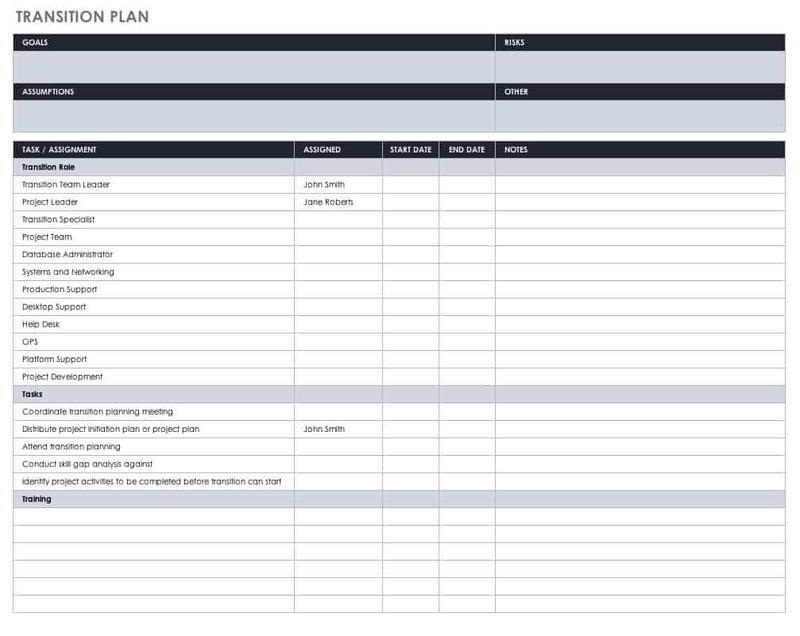 Using a transition plan template is a great way to help the person previously in the role work with the new employee. To expedite onboarding, many companies direct new employees to an employee portal. Onboarding portals should be branded and provide dynamic content. A major advantage of employee onboarding portals is the ability to share, view, and complete important paperwork for both onsite and offsite workers. The end result is that the new employee has a feeling for the company culture and is prepared for their first day on the job. Communicate your company’s brand personality, mission, and vision on your portal and HR website. Here’s a best practices checklist to help you navigate the portal creation process. With all the details involved in an employee onboarding, it’s essential that you have the right tools and processes in place to ensure nothing is missed so that your new employee can get started on the right foot. One such tool is Smartsheet, a work management and automation platform that enables enterprises and teams to get from idea to impact - fast. Leading HR professionals rely on Smartsheet to help manage everything from simple onboarding tasks to complex change management, recruiting, and benefits and retirement tracking. Use Smartsheet to maximize ROI on recruiting activities, stay on top of budget, and streamline internal planning and coordination. Streamline process and paperwork, maintain an auditable database without added effort, and grow your business with better informed, more productive employees. 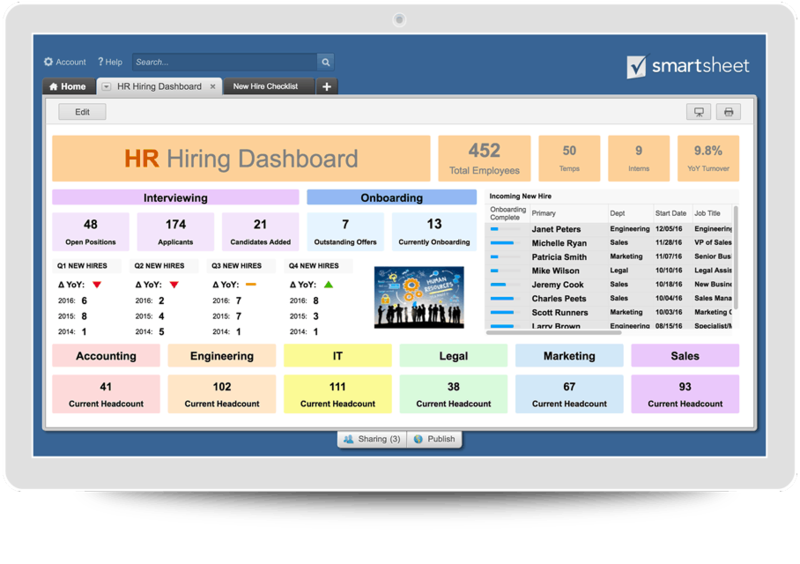 Discover how Smartsheet can help maximize your human resources efforts, today.